I so much want to know how you'd legislate for this. First you'd need a definition that excludes coats and jackets, and maybe an age limit so all those little toddler hooded clothes get excluded as well. Then do you ban the wearing of hoodies, or the purchase of same? If the latter, what if you knitted your own? Would Customs be able to seize them if you bought one abroad? Would we have huge hoodie-burning bonfires? If you banned the wearing of them, would a trade start up in the removal of hoods from garments? Can you wear a hood that isn't attached to anything? Would the police be able to confiscate them, and will everyone get cold and wet as a result? Will there be a ban on watching Robin Hood? Makes veils look simple by comparison. 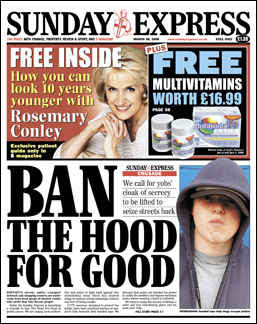 ...and "ban hoodies" is in turn a code for "keep the lower classes in their place". I'm probably stating the obvious but I've just realized that all the big obsessions of the Express and the Mail - yobs, house prices, immigration, government funds for the 'undeserving' - are really about class anxiety. Even the calls for harsher punishment are about how criminals aren't anything like respectable people. That said, from a fashion perspective I think there might be something to be said for banning hooded sweatshirts. I glanced at this in the airport yesterday (having had the same 'what on Earth are they actually suggesting?' reaction) and from my memory of the bit of the story on the front page it was something to do with declaring areas in which the wearing of hoods up was prohibited. Presumably these would be the same kind of thing as the bye-laws you see mentioned in signs up around the place which ban open alcohol containers in some areas. Police would presumably be able to stop anyone wearing anything hood-like that obscured their face from CCTV cameras in one of these areas, ask them to put it down, and do something to them if they refused. I read that Express journalists are striking this week. So this is presumably a pre-emptive strike to avoid having to write any actual news. That's OK, they've got the whitewash inquest into the assassination of the Queen of Hearts to write about for the next fortnight. Does anyone want a small wager on what tomorrow's headline will be? NOW JUDGE GAGS DIANA JURY! BRITAIN OVER-RUN WITH DARK SKINNED PEOPLE. Seems similar to the Danish anti - mask law... which does not have anything to do with superheroes, odly enough. But yes, there was implied islamophobia there too.